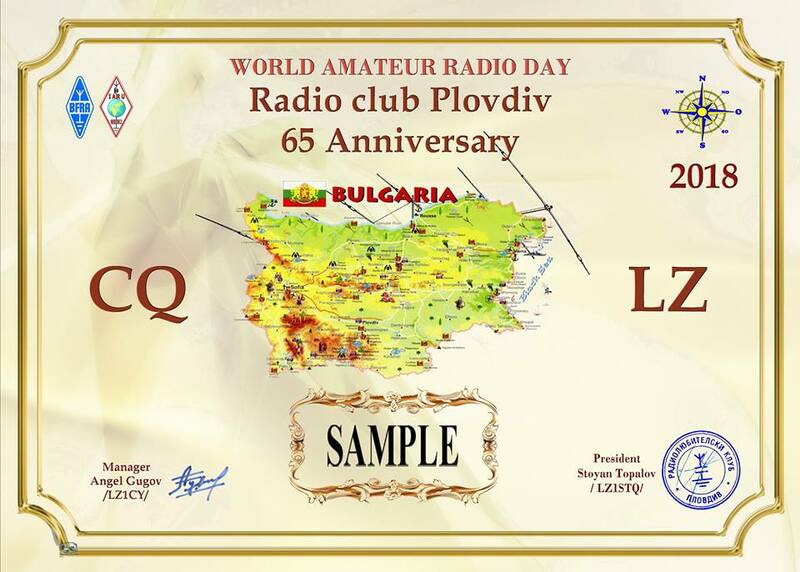 The club of radio amateurs of the city of Plovdiv has established the WARD LZ diploma on the occasion of the international day of radio amateurs and the 65-year-old the jubilee of the club. From 00.00 UTC on the 18th of April to 23.59 UTC on the 30th of April. To conduct 50 radio communications with 18 countries on the DXCC list, including at least 10 QSO with stations in Bulgaria. Or: 50 QSO with different stations of the world, including 1 QS0 with a radio special jubilee station LZ65RCP. Repeated communications on different bands and different types of work, communications through repeaters and satellites are not read. Many thanks to Valentin, RK6AX, for the help! Дипломата LZVHF/UHF Award се издава от Българската федерация на радиолюбителите (БФРЛ) и е отворена за всички лицензирани радиолюбители и SWL. Пълна информация за дипломата може да намерите тук.